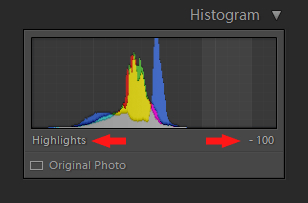 I want to share with you how you can use Lightroom Histogram to simplifies editing workflow even further. Regardless of whether you use Lightroom Rapid Editing or prefer a freestyle workflow, anytime you dive into Lightroom’s main editing tools on the right panel, you always need to adjust the basics. What I mean by basics are exposure, shadows and highlights. I would say that, 99% of the time, I need to tweak or adjust those edits. Normally, you have two choices on how to adjust those parameters. 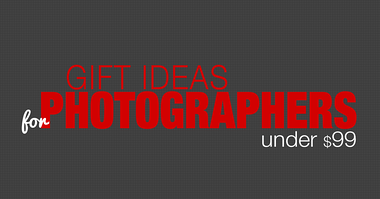 If you use Lightroom Rapid Editing, you can use the TOOLKIT adjustments to modify the exposure, shadows and highlights. If you use freestyle editing, you can open Lightroom’s BASIC editing panel and use the corresponding adjustment sliders. There is also one more way to achieve the same results. 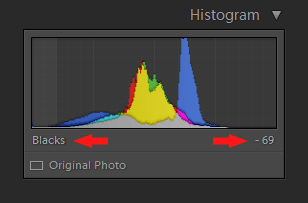 In the top right corner of the Lightroom Development Module, there is a Histogram Panel, which exists to help us evaluate the exposure value by visually illustrating the distribution of pixels from black to white in the selected photo. But, that is not all. 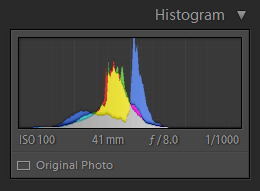 The Histogram Panel also serves as an interactive editing tool. 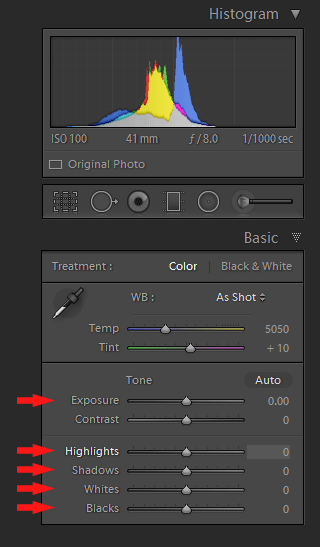 There are five areas in the histogram: Blacks, Shadows, Exposure, Highlights and Whites. By moving mouse over the Lightroom histogram you can select those areas and by dragging them to the left and right (y-axis), you can visually adjust those parameters and change the shape of the histogram in the process. 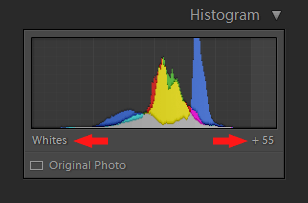 Under the histogram, on the left side, we have the name of the selected parameter and on the right side the value of the selected parameter. For example, if I need to adjust the Exposure in my photo, I select the biggest area in the middle of the Histogram Panel and drag it to the left if I want to decrease the exposure or to the right if I want to increase it. This visual and interactive tool makes basic adjustments both a very rapid and fun process. 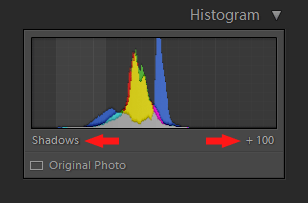 Today, I am going to demonstrate you how you can edit a photo using Histogram Panel only. 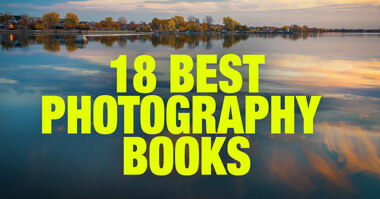 For the sake of demonstration, I am not going to use Rapid Editing or Standard Lightroom editing tools. Here is the original, unprocessed RAW photo I took while driving from Arizona to Utah during my latest Southwest trip. The first step is to recover Highlights and Shadows. I select the Highlights ​area of the Lightroom Histogram panel and dragged it all the way to the left until I reaches value of -100. The result of the recovery was somewhat flat and unappealing. Next, by boosting the Whites and Blacks I can increase the contrast and saturation. 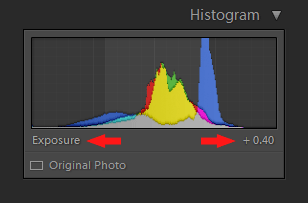 The last step is to select Exposure area in the middle of Lightroom Histogram and drag it to the right until the photo looks properly exposed. The Exposure value of +0.40 looks about right. As you can see this technique allows you to use Lightroom Histogram as a visual interactive editing tool. 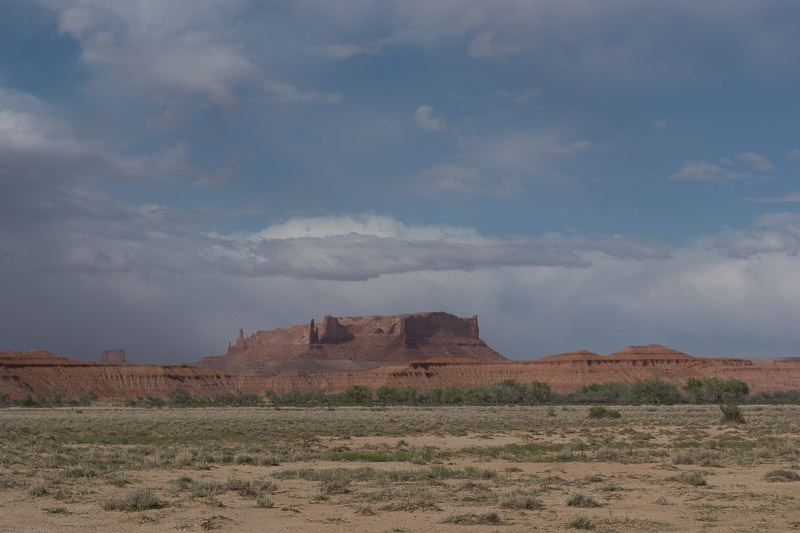 This approach works well with Lightroom Rapid Editing and Lightroom Rapid Editing Plus workflows when you need to adjust the Exposure before or after applying Lightroom Style presets. Cool stuff. Thanks for creating this Viktor. 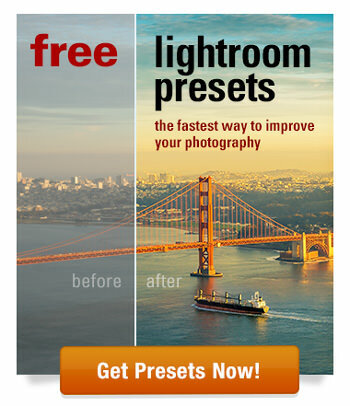 I look forward to trying out your new presets (though it’ll take some time to wean me off of Color Efex Pro). Great illustration, Viktor. I learned about it a while ago, but often forget to use this useful trick. Can you do an article comparing the Highlight, Shadow, etc. sliders in the Basic editing area vs. the ones under the Tone Curve adjustment? They should be the same, but setting one does not automatically set the other and this can be confusing for users. Thank You so Much, I really enjoyed this info and expect to use it. Clearly you cannot always take highlights and shadows to their maxima. You may end up clipping one end or the other of the histogram. I also usually move the Blacks as far to the left as possible without clipping them. Sometimes a little clipping actually looks best.